The US has not reduced the number of non-immigrant visas issued to Guyanese nor has it adopted policies that have led to many being deported back here. This is according to outgoing US ambassador, Perry Holloway, who has ended his tour, and is heading into retirement. The diplomat left on December 8, 2018 after overseeing a key period of transition in which one of the US’ biggest companies, ExxonMobil, is set to start oil production offshore Guyana in 2020. 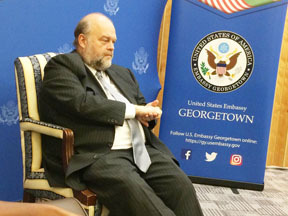 Speaking to reporters on Tuesday at the Duke and Young Street embassy, Holloway in responding to questions on perceptions that the number of visitors’ visas for Guyana has been reduced, said he has seen no evidence of this. He said also that there has not been an increase in deportations. While a plane may come every few months with varying number of persons who committed crimes in the US and are being sent back, the yearly average has not seen much change. In fact, there has been quite a “few Guyanese” granted visas. While not giving figures, the official who has been here since 2015, noted that at the beginning of the Donald Trump administration, in 2016, a record number of visas were issued. Holloway said that there have been no orders to change the policy or evidence of a perceptible shift. On the issue of immigrant visas, thousands of Guyanese live especially in the New York area. Others have been going up and there is no drop in that. A visa is a travel document, affixed to a passport, granting citizens from foreign countries permission to enter the United States for a certain purpose, whether it’s a business trip, a family vacation or a student exchange programme. Unlike passports, visas are issued by the country a traveler is intending to visit. A visa, approved by a consular officer in the traveler’s home country, does not guarantee admission to the United States. Officials from Customs and Border Protection (CBP), on behalf of the Department of Homeland Security (DHS), may deny a traveler permission to enter the United States for a variety of reasons, even if the individual has a valid visa. According to figures of immigrant and non-immigrant visas issued at embassies for immediate relatives, it was 236,526 for 2018 so far as compared to 254,430 in 2017. For this year, over 9.6M visitors’ visas were issued as compared to the 10.3M last year. According to figures released by the US, the number of immigrant visas issued to Guyanese this year is almost 7,700.